Policy agendas are curious beasts. There are always more ideas running around than most political systems can process, so some “get up” while others are overlooked or ignored. When it comes to implementation, the channelling process can be even more selective. Not so long ago, policymakers talked about tackling climate change on many fronts. Now it seems there is just one: renewables. In the name of renewables, we have created a protective amulet called “green energy”. We have subsidised green energy to the point where other ways of dealing with emissions – for example, planting or even just conserving trees – do not receive nearly as much attention as they should. There is a familiar ring to this, isn’t there? We may wear the protective amulet of green energy, but we still believe in growth, and the sacrifices that must be made to keep it going. 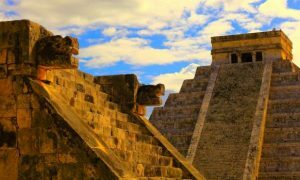 Unlike the Maya, who built stone pyramids, we continue to build crazy pyramids of debt, with periodic sacrifices of the less fortunate to keep the priesthood going. As long as the priests ensure that the goodies keep appearing, we more or less do what they say. But the have-nots are banging at the doors of the citadel and, in many cases, have breached it entirely. Among the haves, many are beginning to notice that there are some who have a great deal more than others. All the time, the earth’s natural systems continue to evolve – underneath, above us and around us. Whatever we think we know, we are, like the Maya, prisoners of our past assumptions. In some ways, the earth seems massive and resilient to us, the oceans endless. On the other hand, it doesn’t take much to wreck the ecology of an area. Australia shows examples of it everywhere: eroded creek beds, paddocks infested with serrated tussock, and feral animals in their thousands roaming the landscape. The soils will produce but only with the application of extensive superphosphate, trace elements and irrigation water. Bringing them back to productivity naturally is a slow and expensive business. Imagine our stadiums, airports, hospitals, universities, skyscrapers and churches being visited by curious tourists several centuries hence. What were those people thinking, they might ask? Why did they keep on building monuments when they knew they weren’t sustainable? Our cities are the places of our greatest achievements, but they could also be responsible for our greatest vulnerabilities.